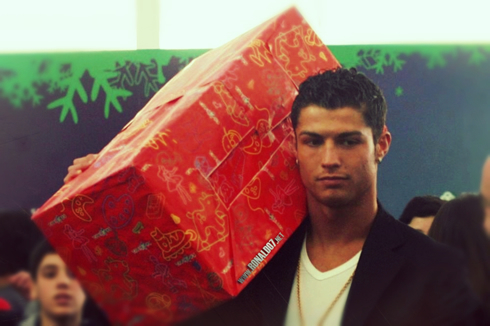 ﻿ Ronaldo7.net powers its 3rd Christmas yearly donation to "ONExONE"
24.12.2013 » Ronaldo7.net powers its 3rd Christmas yearly donation to "ONExONE"
Christmas has arrived and just like we've done for the past 2 years, Ronaldo7.net will lead another self donation to ONExONE, a non-profit foundation that was created to support and improve the lives of millions of children. We have made a post on Facebook (the "Target Post"), which you can start by opening by clicking here. 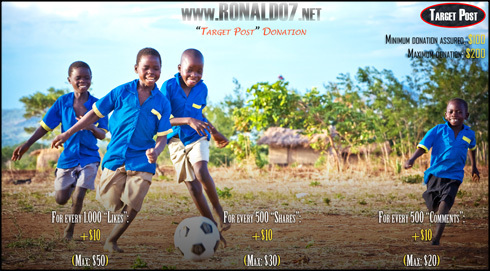 Depending on the level of engagement this post will generate (measured in terms of likes/shares/comments), Ronaldo7.net will then commit to donate different sums of money. 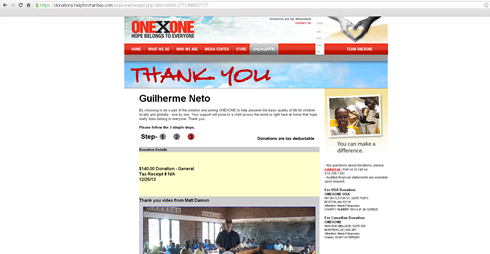 It's also important to note that regardless of the virality that this initiative will get, Ronaldo7.net will always donate a minimum of $100 to ONExONE. What happens next is that if the "Target Post" collects a certain amount of likes/shares/comments on Facebook, the exact donation amount will increase. 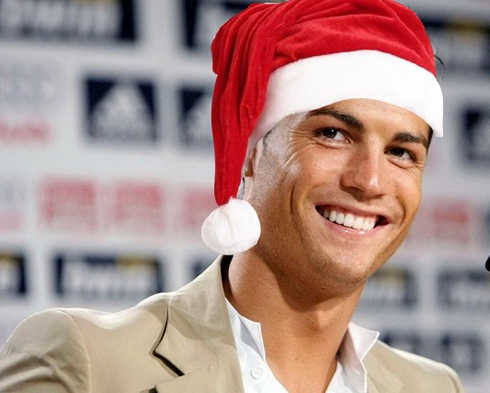 Once again and just to make it clear, all money will be donated by us (Ronaldo7.net) and not from the public. ••• For every 1.000 "Likes" the "Target Post" gets, $10 will be added to the initial and base amount of $100. A maximum cap is set at 5.000 likes ($10*5=$50). 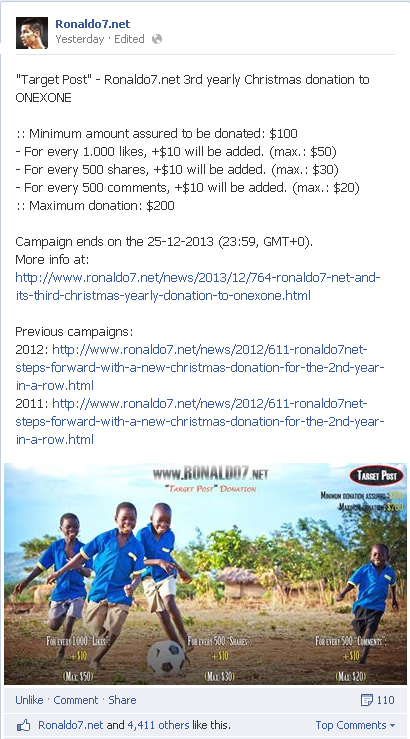 ••• For every 500 "shares" the "Target Post" gets, $10 will be added to the initial and base amounf of $100. A maximum cap is set at 1.500 shares ($10*3=$30). ••• For every 500 "comments" the "Target Post" gets, $10 will be added to the initial amount of $100. A maximum cap is set at 1.000 comments ($10*2=$20). 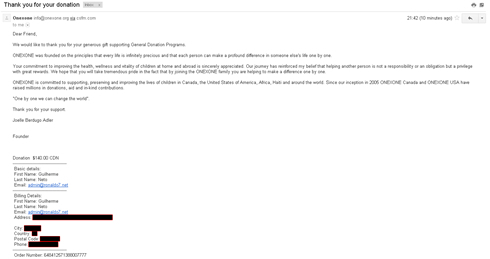 As seen and explained above, the final donation amount will be between $100 (if none of the goals are achieved) and $200 (in the best case scenario where all the 10 goals are achieved). The timeframe to measure the engagement made with the "Target Post" will go from today, until 11:59 (PM) of December 25. The donation will then be made on December 26. 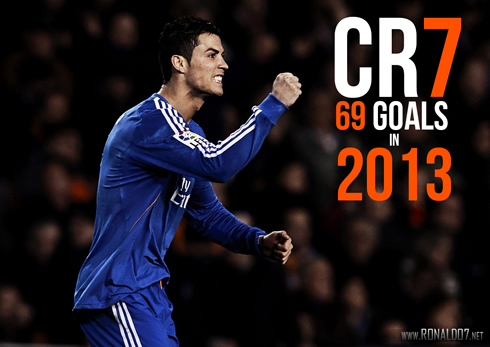 Cristiano Ronaldo next game will be in Real Madrid against PSG, in the club's first friendly game of 2014 (January 2). You can watch Juventus live stream, Real Madrid vs PSG, Barcelona vs Elche, Hull vs Manchester United and West Ham vs Arsenal, all matches provided from our football live streaming section.